The young Prince Edward first visited Brighton with his parents, Victoria and Albert, in 1842, aged less than one year. 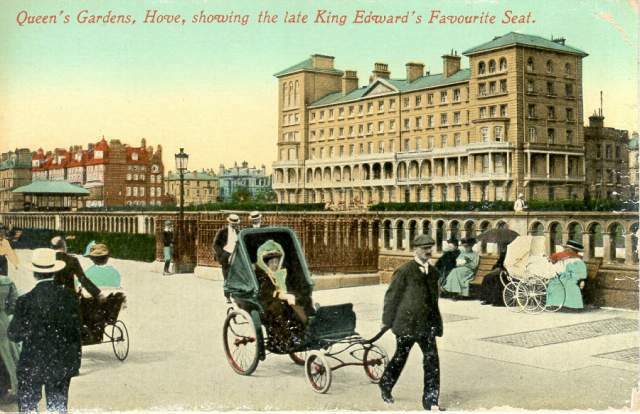 Edward came to the town many more times as Prince of Wales, and after he had succeeded his mother on 22 January 1901 at the age of fifty-nine, he convalesced in Brighton on several occasions in an attempt to improve his health; he suffered from bronchitis. He stayed with his daughter, Princess Louise, at her house, 1 Lewes Crescent, for a week in February 1908 and was afforded exclusive use of the Kemp Town enclosures. He was also a friend of the Sassoon family, and often stayed with Arthur Sassoon at 8 King’s Gardens, Hove. The return of the sovereign to Brighton after some sixty years helped to re-establish Brighton’s fashionable reputation and winter society season, and brought about a general revival in the town’s fortunes. In 1908, in honour of the King, the corporation renamed the Kemp Town ward (and also tried, unsuccessfully, to rename the whole area) ‘King’s Cliff’, and also appended that title to Marine Parade. The Peace Statue on the Hove boundary is also a memorial to King Edward VII (see “King’s Road”), while Hove renamed its coast road ‘Kingsway’. Relative of William the Conqueror?